What do you get when you join 700 learners, theatre-makers, artists, dancers, storytellers and musicians? 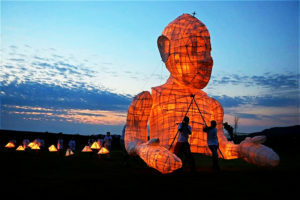 The unique Clanwilliam Arts Project/ Lantern Festival. 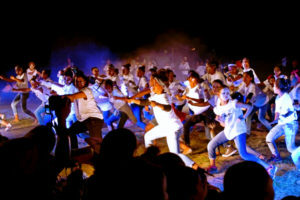 Back for the 17th year in a row, Magnet Theatre in partnership with The UCT Drama Department, The UCT College of Music and The Michaelis School of Fine Arts and Jazzart Dance Theatre, will be working with some 700 learners in the Western Cape town of Clanwilliam to resurrect the Clanwilliam Arts Project/ Lantern Festival. The project starts on 24 September 2017 and the facilitators and learners will be busy for week running workshops interpreting and re-enacting a story told by the Xam (Cape San) people who occupied the area they live in today, countless years ago. The Clanwilliam Arts Project includes archeology, education, art and drama and is aimed at returning the heritage of the Clanwilliam area to the community. On the evening of Sunday 1 October there will be a parade and performance of The Lizard, The Beetle, The Mice and the Mantis. The chosen story always holds a modern-day lesson for the children, and is chosen each year from an archive of San narratives recorded by colonial linguists Lucy Lloyd and Wilhelm Bleek in the 1870s. This archive has formed the basis for the Clanwilliam Arts Project which is an ongoing collaboration between the University of Cape Town and Magnet Theatre, generously funded by Rooibos LTD, with support from UCT and the Clanwilliam Sakekamer. Next articleDisney Africa: Upcoming Movies!